Tis’ the season to be jolly with lots of love, joy, food and more importantly—good music. If you’re looking for a Christmas CD to kick off your holidays, there is no doubt that R&B superstar Tamar Braxton’s new Christmas holiday CD should be on your list of Christmas albums to enjoy. The ‘Love and War’ singer’s new album, “Winter Loverland” will surely set the holiday mood with your significant other in true Tamar fashion. I’m typically not a fan of Christmas music for personal reasons but I couldn’t help myself but to take a peek and listen to “Winter Loverland.” As a follow up from Braxton’s debut album, “Love and War,” I was thoroughly surprised and impressed at the vocals and sound structure this album provided. A true Tamar fan at heart, I listened to every song without skipping a track. “Winter Loverland” truly put me in the Christmas spirit as the track list provided songs of true joy that will ring true during this holiday season. The first couple of tracks are your typical Christmas songs including, ‘Sleigh Ride,’ ‘Santa Baby’ and ‘Santa Clause Is Coming to Town.’ Although the first few songs are typical seasonal songs, the instrumentals and production work behind them are catchy and will surely leave you wanting to dance with your lover. The album shifts to a more romantic setting with ‘No Gift’ which tells the story of a woman who doesn’t receive a Christmas gift from her lover. If you want to listen to a song that will put you in a love mood with your honey, ‘Merry Christmas Darling’ is the song for you. The album offers ten tracks each with their own different personality. Although this album is seasonal, I can honestly say that I will listen to this CD even after the holidays. Whether you are trying to maintain and not gain or need some good seasonal music to listen to while in the gym—this album will do the trick. 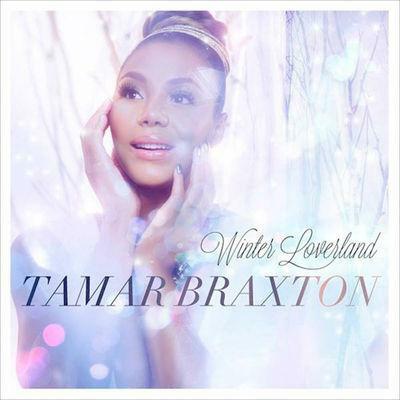 Although Christmas music isn’t my first choice of music, my favorite song on this album is the traditional and popular song, ‘Silent Night.” Braxton takes the classic song and adds her flair and diva like style to this traditional Christmas song. Vocally, Braxton delivers on this album as usual. Tamar’s on point and true to self lyrics is what makes her stand out in the ever growing list of rising R&B singers. There is no denial in her talent and fans will appreciate her contribution to the holiday spirit this season. Even if you’re not into Christmas music, “Winter Loverland” is worth a listen and will also make a great stocking stuffer. Since we are in a love season, this album is also great to play during cuddle sessions by the fireplace with your lover. As the album titles, it will truly take you into a ‘winter loverland’ and should certainly be added to your list of Christmas love songs for the holidays.